This is the part 3 of my investing for kids series. We’ve talked about what you need to prepare and what is my fund recommendation. Now in part 3, we will look at some other investment options for kids. One of the most popular investment options of kids is savings and term deposit in Bank. It is simple, easy to understand, easy to set up and very safe investment. However, since most of the kid’s investment a for the long term, I think bank deposit is just too safe for that time frame. I believe kids can take up more risk than a term deposit. The average return on term deposit was around 4-5% and now is around 3-4%. The long-term return of stock market is about 6-7%. Here is an analysis comparing the return on term deposit and stock investment for 14 years (March 2003 to Aug 2017). I used historical retail term deposit return from RBNZ and compare to NZX50 index return. I ignored dividend in NZX50 for the ease of calculation. In reality, NZX return will be higher if we included dividend reinvest. Monthly contribution is $50. Tax rate at 10.5%. As you can see, the after-tax return on stock and much better than term deposit in a long run. The share took a dip during GFC in 08-09, and the performance is actually lower than the term deposit. However, it quickly recovers and suppresses bank deposit. In the end, stock overperformed by 57%. Here is a quote from a reader. Well, a lot of people concerned about those investment service providers is running a Ponzi scam. I’ve done some research on that area, and I am personally are satisfy with the result before I recommend them. We will look into how safe is your investment in another blog post. Most of the retail bank in New Zealand offers investment product for kids. However, the fees they are charging are much higher compared to my recommendations. 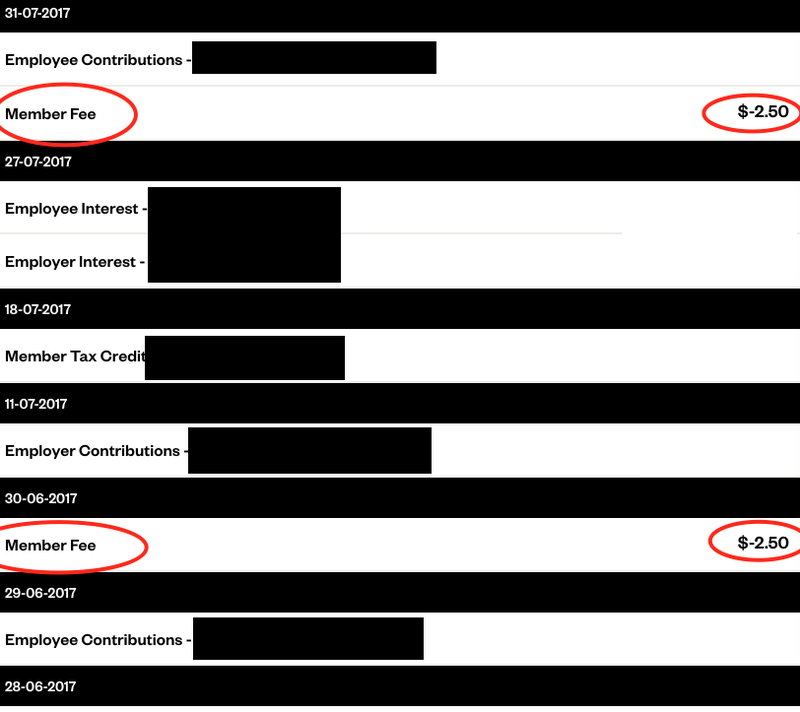 Most of the management fee is average at around 1%-2%. They also have a higher initial investment requirement, higher lump sum investment amount. They will charge a to put money into their investment and charge another fee when you want to take your money out. Some of them have performance fee as well. All of those are just too high for my preference. However, if I have to pick one, I will recommend ASB investment fund. ASB Investment funds management fee is at the low end amongst retail banks. They mostly invested in low-cost passive index fund from BlackRock, and that’s why they can offer a lower fee. Please make sure you understand their fees structure before you join. Invest in Adults name is a simple and easy solution. The good thing is you will not be limited by the age restriction from many investment services, and you are free to invest in anything. However, as I pointed out early, the investment return will be taxed at your own PIR rate, so that is not tax efficient. Here is an example of the same investment with the different tax rate. When you sign up for SmartShares contribution plan, there is an option for you to sign your kids up for some SmartShares. However, SmartShares is a listed-PIE fund, and all investors got taxed at 28% regardless your PIR rate. So SmartShares will be tax ineffective for your kids. However, if you already using an accountant, you can get them to claim those tax back. Ruth from thehappysaver.com wrote two excellent blog posts on putting her kid on SmartShares. Check it out. Another common way to invest for children. The Mum/Dad buy shares in some company under their kid’s name. It is great especially if you are already familiar with stock trading. You can also buy SmartShares ETF directly on the stock market which makes it a great options. However, there is a cost everything you buy or sell on the stock market, so that is not good for regular or small amount investing. Also, you are supposed to pay tax on your dividend received. So there is some added work to do. KiwiSaver used to be top investment choice for your children as they used to be $1000 kick-start and member tax credit for kids. However, our government had taken those benefit away, and the only benefit for kids join KiwiSaver is they will have lots of choices to participate with no limitation. For example, if you want your kids to join the investment fund from Simplicity but they won’t accept under 18 years old, you can get your kids to join their KiwiSaver. However, the significant disadvantage of KiwiSaver for kids is the limitation on how and when they can use that money. Currently, They can only get the money out to buy their first home, or they turn 65. So it limited how your kids can use that money. They can’t use that for study, can’t use that for OE or start their own business. If you already started KiwiSaver for your kids, you should keep your money there and let it grow. You don’t have to put more money in until they turn 18 years old. If you haven’t started, invest your money outside KiwiSaver. Only get them to join once they turn 18. Another favorite gift for kids. Bonus Bonds were first introduced by the Government in 1970 as a way of encouraging New Zealanders to save more. However, people need to understand this. Bonus Bond is NOT an investment. Bonus bond is merely a placeholder for a lottery. Bonus Bond pays no interest or dividend. It is highly unlikely your kids will get that million dollar price from them. So if you have the money, you will be better off to keep it in the bank where you can earn interest. If your kids got them as a gift, you should accept it and understand your kids have a placeholder for a lottery. If your kids have over $100 in bonus bond, you should cash out down to $100 and try your luck. A term deposit is a safe investment, but the return is too low. Investment product with big banks are subjective safer for some people but comes with a higher cost and more limitation. Invest in Adult’s Name is simple and straightforward. Also, it will have a lot more options available. However, you will pay more tax then you suppose to. Buy shares on share market is not ideal for regular or small sum investing due to the cost of trade on each transaction. KiwiSaver will have more investment options for kids. However, it limits how they can use that money. Bouns Bond is NOT an investment. It’s merely a placeholder for a lottery. Don’t put more than $100 in there. Simplicity Guaranteed Income fund, What’s that and How it Works? 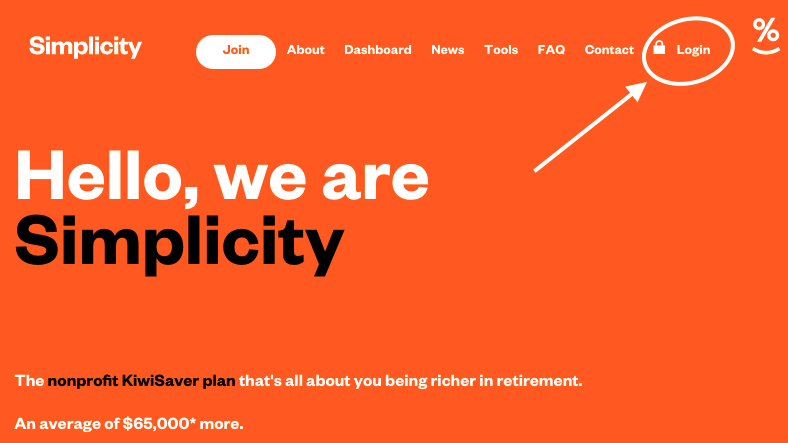 Simplicity, the non-profit and low-cost KiwiSaver provider introduced a new fund last week called “Guaranteed income fund.” Guaranteed income investment products had been around for years in other overseas markets, but it’s very new to New Zealand. So in this blog post we will look at what is guaranteed income fund, how does it work, the pros, the cons and do you need it. 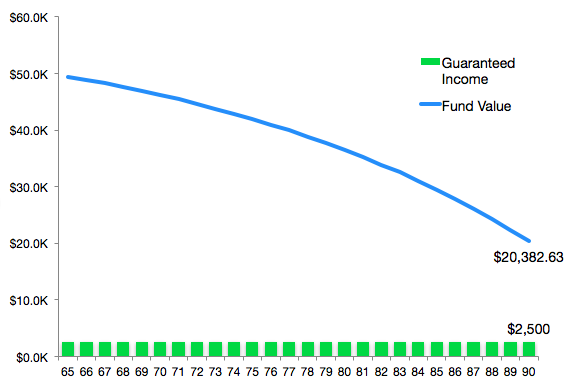 The guaranteed income fund is basically an annuity. 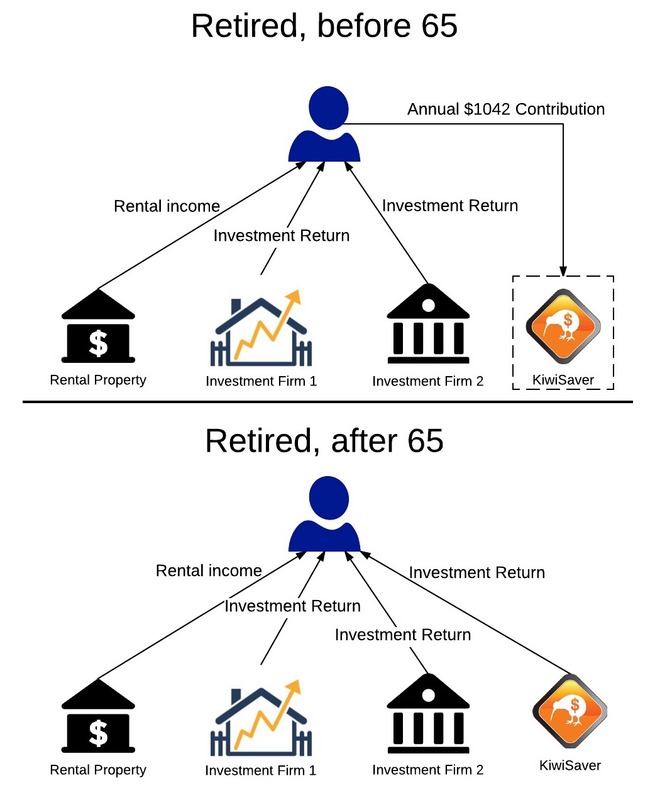 They provide a stable and secure source of retirement income. You will need to surrender a sum of money in exchange for a stream of income that’s guaranteed for life. The annuity has been around for a very long time in the overseas market. Usually, annuity service is offered by an insurance company because there is a guaranteed element in this product. New Zealand just had our first annuity service from LifeTime Income Ltd not long ago. Simplicity now partners with Lifetime Income Ltd and provide a guaranteed income fund that offers 5% guaranteed return at age 65 for the rest of your life. The minimum amount is $50,000, the annual cost is $30, fund management cost is 0.31%, and insurance cost is 1.3% of your protected income base. Protected income base is your initial investment if you start receiving cash payment immediately. If you decided to delay receiving the cash payment, your protected income base would be either your initial investment amount or the current fund value, whichever is higher. We will explain that later. You can think of it as you borrow some money to another person. That individual will keep paying you interest at 5% for the rest of your life. Here is an example of how it works. Assume you are now 65. You decided to put $50,000 into Simplicity Guaranteed income fund and start receiving the cash income immediately. Every year, you will receive 5% of that $50,000, which is $2,500. 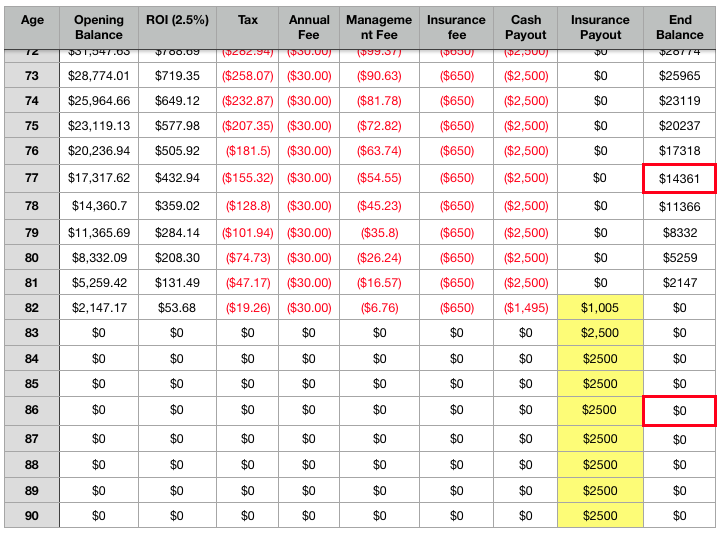 It will payout fortnightly at $2,500 / 26 = $96.15 for the rest of your life. The $50,000 are still with Simplicity as an investment. That money will continue increase or reduce according to how the investment market performs, tax and fee charges. The cash you receive will also come from that fund as well. Apply that to our $50,000 example with 6.5% return, Taxed under FDR rule with PIR at 17.5%, here is the performance for the first year. Here is the graph of your fund value over the years. What if my fund runs out? As you can see with 6.5% return, your fund value will keep going down, and you will run out of money some day. If your investment fund is exhausted, there will be no money to draw from. At this point, the insurance policy will take over and pay out that guaranteed amount ($2,500/year) for the rest of your life. That’s why there are a 1.3% insurance charges on the fund. Now I will use the same example but lower the return on investment to 2.5%. Your investment fund exhausted age 82. You can only draw $1,495 from your fund at that year. The insurance company will pick up the tap and continue to pay the guaranteed income for the rest of your life. Here is a closer look at guaranteed income. Insurance policy kicks in at age 82 and continue. Can I delay and get more Cash Payout? The 5% is the minimum income guarantee. It goes by 0.1% each year that you defer taking out the guaranteed income. When you start getting the income at 65, the guaranteed rate is 5%; if you start getting it at 70, the guaranteed rate is 5.5%. It tops at age 90 with 7%. The money in the fund will increase or decrease with the investment return but there is no cash withdraw. 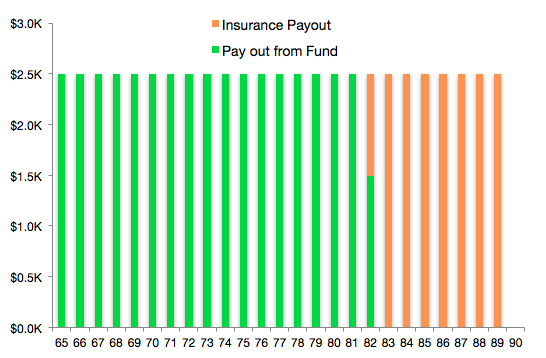 Here is an example when you join at 65 but only start to get income at 70 and get 5.5% guaranteed income. What if the receiver pass away? If the receiver passes away, whatever left in the account will be passed on to their estate. Now, let’s go back to our 2.5% return example. 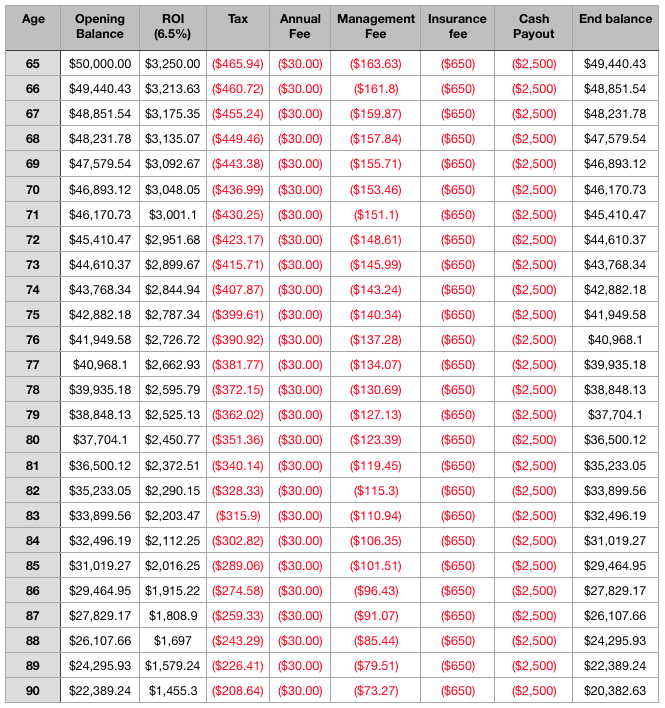 If the receiver passes away at age 77, there are still $16.962 capital in the account. That amount will pass onto receiver’s beneficiary. 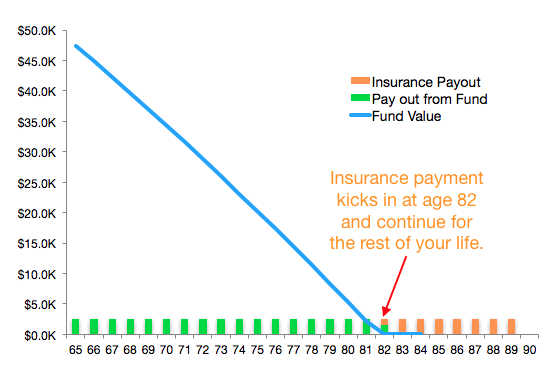 On the other hand, if the receiver passes away at age 86, there will be no money left in the fund. So there will be no money to receiver’s beneficiary, and the insurance payment will stop. 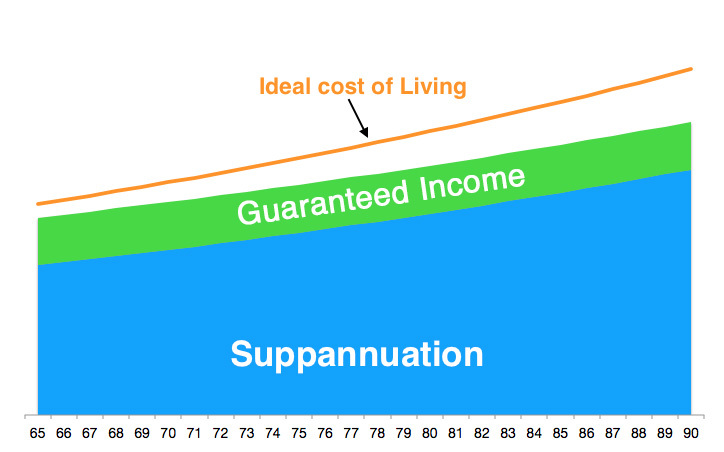 Imagine you are now retired and you only living on superannuation plus your saving. Every time you spend money on the power bill, water and food, your retirement saving go down a little bit. Do you worry you may outlive your retirement savings and have to live on superannuation alone? This is a real concern for many retirees and it reduces their spending in retirement years. Below is the typical situation for New Zealand retiree. Their retirement is partly funded by superannuation and their own savings/income to reach their ideal standard of living. Since we don’t know how long we are going to live, some retirees worry they may outlive theirs. So they reduce their spending and stand and hope the saving will least long enough. The living standard reduced as a result. Since guaranteed income fund and annuity provide a steady stream of income for life, it is a powerful tool for retirees. You can surrender part of your retirement saving and exchange for a guaranteed income for life. Add that on to superannuation from the government, you will have a bigger part of fixed income every fortnight. So it will help to bridge the gap between your living expenses and superannuation. Also, It will reduce the concern if you will out the saving. The most significant benefit its gives you the certainty that you can always fall back to Superannuation + guaranteed income level. There is always a catch with investment and insurance products. There are certain restrictions and risk regarding guaranteed income fund. 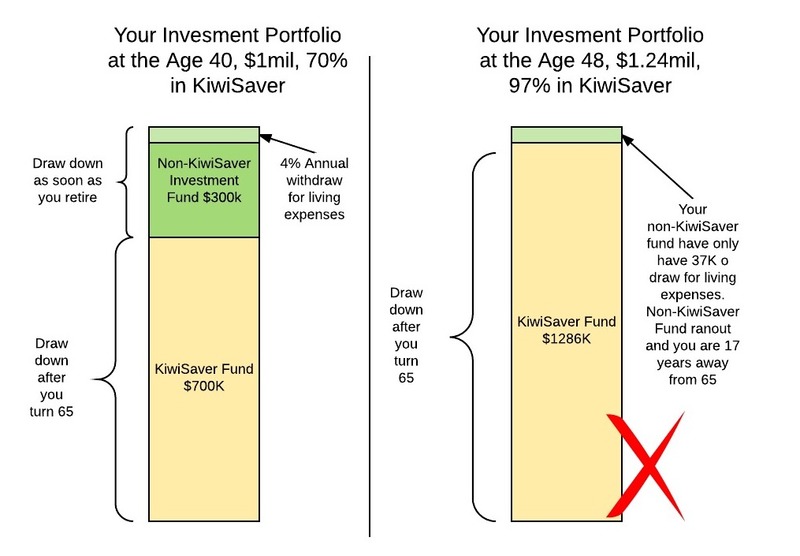 KiwiSaver Only – currently this fund is only open to the KiwiSaver member. 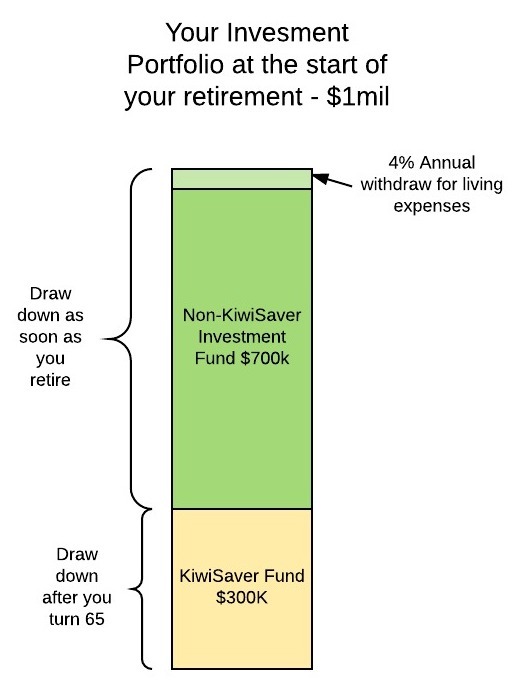 If you are not eligible for KiwiSaver or you already left KiwiSaver, you can’t join the fund. Also, you’ll have to be 65 to start receiving a cash payment. Alternatively, you can get the annuity from Lifetime Income with a higher cost. Fixed amount – It is great that you will have an income for the rest of your life. However, that amount is set for life as well. So inflation will be your biggest problem. With inflation, the same amount of money will have less buying power. In the early 2000s, the price of petrol was well below $1. I can fill my tank for $30-$40. Now, I can only fill 60% of the same tank with $40. Here is a table of the real value for $2500 after 2% inflation. 10 years in at age 75, that $2500 will worth about $2000 today, it lost about 20% of its value. Since the cost of living and superannuation are rising along with inflation, you will have to fund more of your living expenses out of your retirement savings. Just like the graph below. However, people tend to spend less as they age. Although the cost of living increased, the cost for an ideal living standard will decrease and it softens the effect on inflation. Cost: This fund is very similar to Simplicity balanced fund and they have the same admin fee and management cost. However, guaranteed income fund have an insurance policy attached to it and it cost 1.3% of your initial fund amount. No matter how your fund performs, it will charge the same amount of insurance fee. Insurer risk: Since this fund has an insurance policy, there is always the risk of insurance company collapse. The insurer is Lifetime income limited, which is not a big insurance company like AIG. Access to fund: You will need to surrender a large sum of cash to the investment provided to start your income guaranteed fund. There are limitations on how you can withdraw your fund from the plan. First, your fund may not have enough money due to the fees and investment return. If there are fund to pull out from, you can either withdraw up to 20% of your fund and take a pay cut by the same percentage you took out. The other options are completely empty your fund. The good thing is Simplicity will not charge a fee on that. I think it’s great that there is one more option for New Zealand retirees with Guaranteed Income fund. It will reduce the concern of retirees outlive their savings and provide a fallback for them if they have to scale back their spending. Make sure you understand Guaranteed Income fund is just one of the many options for retirees and you should not put all of your eggs in one basket. I will include them as part of the retirement plan along with term deposit, investment fund or property and superannuation. The key point is you should not put all of your money into Guaranteed Income fund and annuity. 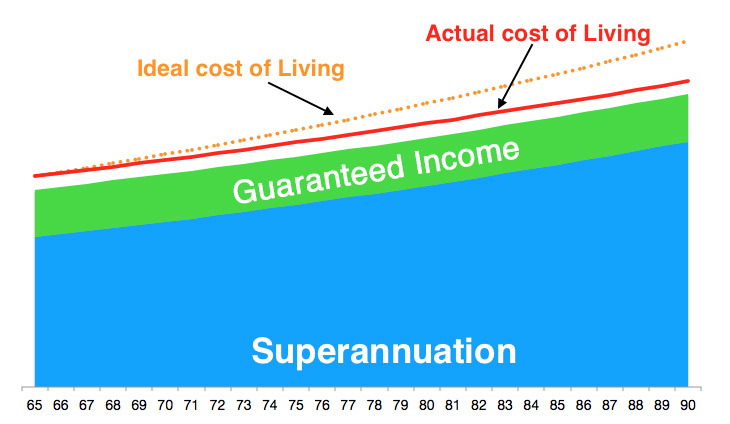 One way to work out how much guaranteed income you’ll need is to decide how much income you wish to be guaranteed along with superannuation income. For example, a married couple will get $1200.60 each fortnight. They also worked out their ideal living standard will cost them $2350 each fortnight including nice food, shopping, dining out, travel and avocado on toast every Sunday. On the other hand, we can cover their basic expenses (power, water, communication, petrol and basic food) for $1500 each fortnight. If the couple wants to the guaranteed income cover their ideal living standard, the guaranteed income needs to be $2500 – $1200 = $1300 each fortnight. To get that amount of guaranteed income, the couple will have $1300 x 26 / 5% = $676k in the fund. That is not a small amount for most people. How about we just need to cover the basic. The guaranteed income will be $1500 – $2500 = $300 each fortnight and the fund value will be $300 x 26 / 5% = $156k. This amount is not too big and seems reasonable to average retirees. It will cover the basic for the couple at their early stage of retirement. They will be happy to know if anything happens that cost all of their life-saving, they will still have enough to cover the basic living with superannuation and guaranteed income. They can even increase the fund value to hedge against inflation. Simplicity offer Guaranteed Income fund for the KiwiSaver member. The investment fund is similar to Balanced fund with $30/year admin fund, 0.31% fund management fee and 1.3% insurance cost based on the initial fund value. Investors will receive 5% of the initial fund value as cash payment every year from 65 for the rest of their life. The cash payment is drawn from your investment fund. If the investment fund runs out, an insurance policy will kick in and provide the cash payment. This is a great option (in combine with superannuation) for retirees to set a safety income line. Do not over commit. This fund should be part of your retirement plan along with superannuation, term deposit, and other investment. A reader asked me about their Superlife fund charges. 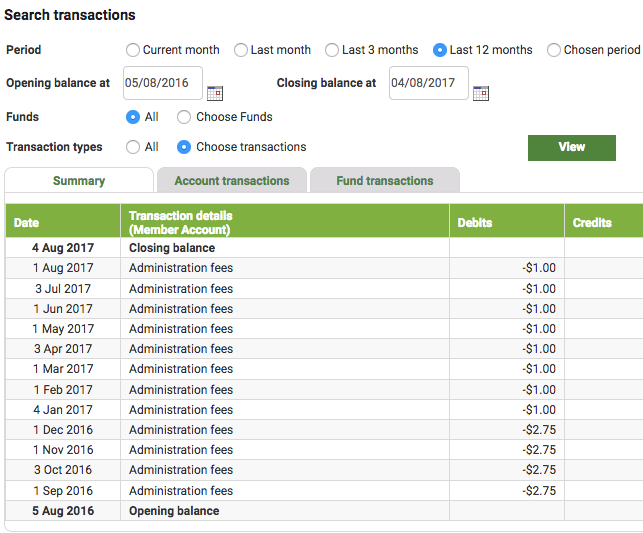 She notices something funny on her transaction list: Instead of charging $1/month on admin fee, she got charged $1/day. After checking my transaction, I believe those charges are incorrect and she contacted Superlife. Superlife immediately said the charges were wrong and reversed them straight away. This is a good reminder for all investors to a take look at their transaction once in a while. I am all for ‘set and forget’ method to invest but we should look at those charges maybe once or twice a year. 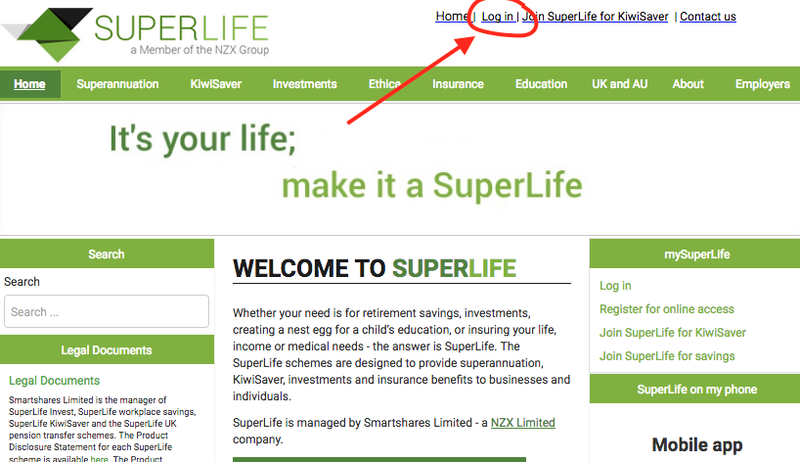 Not only to Superlife but all of your investments including your KiwiSaver. 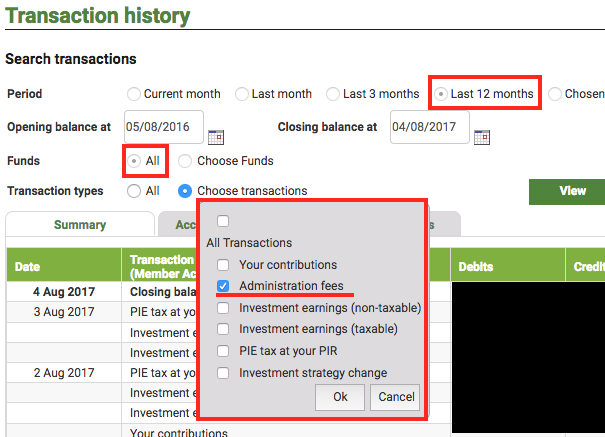 Select ‘last 12 months’ on period, select ‘All’ on Funds, select ‘Administration Fees’ on Transaction types. Go to Simplicity.kiwi and Log in. 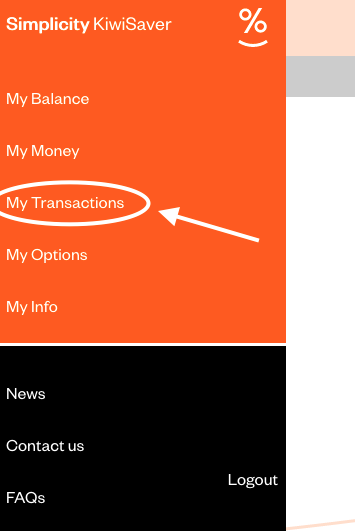 Click ‘My transaction’ on the menu. There will be a list of transactions and Simplicity should charge $2.5/month on member fee. If you are with a different fund or service and don’t know how to check transactions, call the service provider and ask them. If there is anything out of the ordinary, you should contact the fund manager and get them to correct that as soon as possible. By New Zealand law, the employer required to contribute to their employee’s KiwiSaver account or complying fund at 3% of their gross salary or wage if the employee joined Kiwisaver. However, when you look into your KiwiSaver contribution transaction record as an employee, you may notice the employer contribution amount are less than your employee contribution. 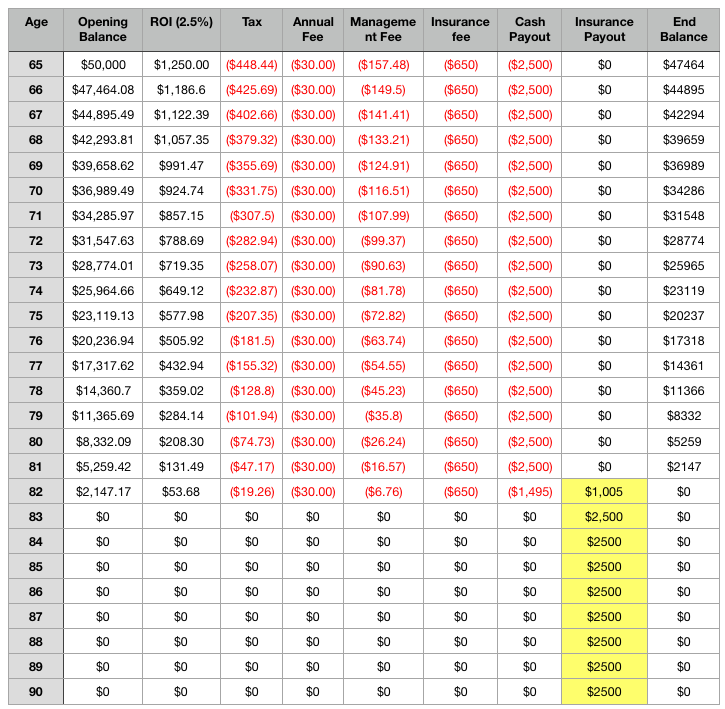 Here is an example, assume your weekly income before tax is $1200, $62400/year. Without KiwiSaver, your take home pay will be $1200 – 225.77 (PAYE) – 16.68 (ACC) = $957.55. If you join KiwiSaver and contribute 3%, your take home pay will be $1200 – 225.77 (PAYE) – 16.68 (ACC) – 36 (KiwiSaver) = 921.55 On your KiwiSaver statement, your contribution will be $36. However, your employer contribution will be $25.2, not $36. Why? The reason is the employer contribution are taxed under Employer superannuation contribution tax (ESCT). 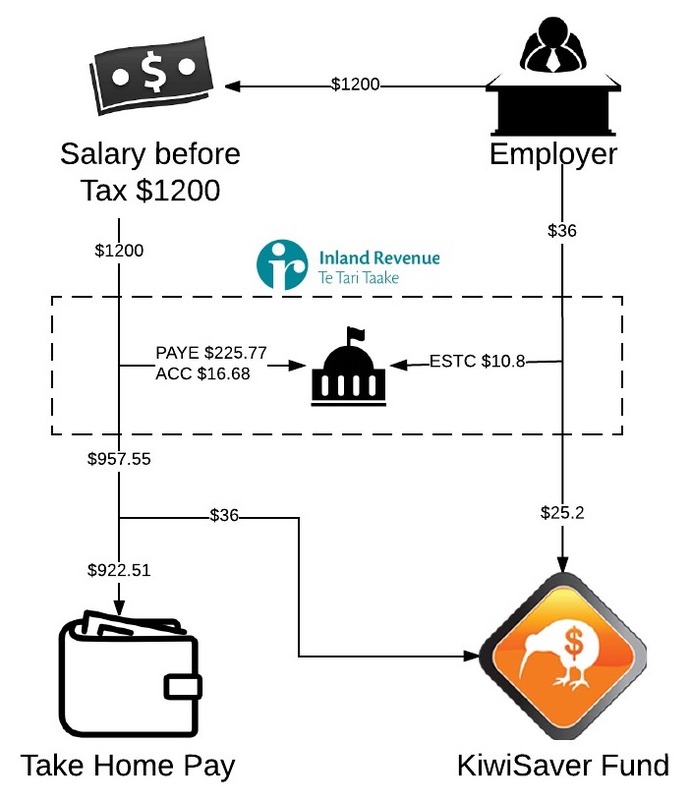 Your employer payout extra 3% of your income to KiwiSaver but part of that went to IRD as tax. Let’s break it down in detail. The 3% contribution is calculated based on your income before tax. 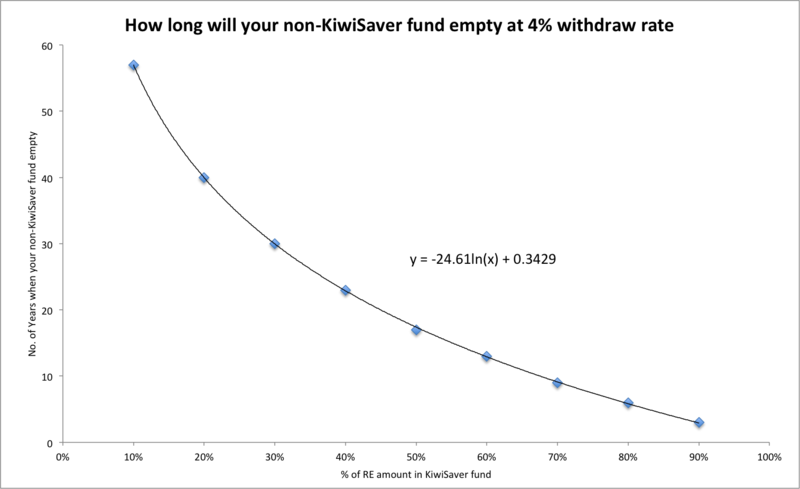 In our example, the weekly 3% KiwiSaver contribution will be $1200 x 3% = $36. So both employee and employer will pay $36 each into the KiwiSaver Fund. Here is the tricky part, on employee contribution, it was calculate based on pre-tax income and take out on after-tax income. So the $36 will take out after they deduct PAYE and ACC and that $36 will reach your KiwiSaver fund without IRD take out any more tax. Therefore, I was wrong by saying you will have 100% return on your employer contribution. It’s more like 67%-89.5% return. It’s still an unbeatable risk-free guaranteed return and one of the best investment in New Zealand. Check out IRD website on ESCT for more information. P.S. Thanks to gligorkot for pointing that out on a previous blog post. Will you switch KiwiSaver plan during a market correction? I’ve got into a discussion with a colleague about changing KiwiSaver plan. He is in his 30s and he decided to switch his growth plan to a defensive scheme. His reasoning was that he thinks there is a market correction coming in late 2016 or the first half of 2017, so by switching to the defensive scheme, he can avoid a drop in his investment. He will switch back to growth once we are out of the correction. I do agree there is a market correction coming and a defensive scheme will do better in a down market compared to a growth plan. Let’s use Superlife income (defensive scheme) and Superlife60 (growth) as an example. During the 2008 GFC, most markets were down by A LOT. 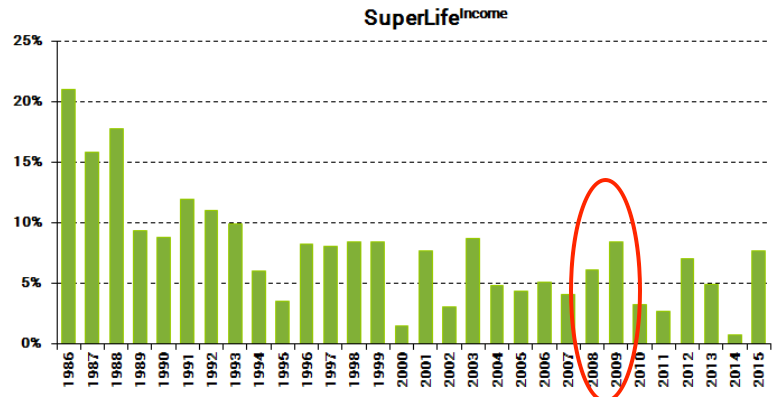 SuperLife income returned about 6% to 8% during 2008-2009 and SuperLife60 was returning -8% to -14% at the same time. 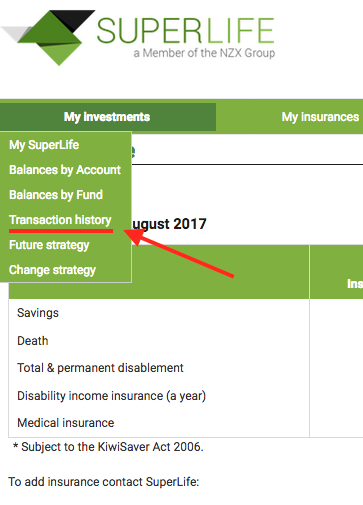 So if you start your Kiwisaver in 07 in SuperLife 60 (returning 4.8%), then switch to SuperLife Income at 08, 09 (6% and 8%), and finally switch back to SuperLife 60 at 2010 (15%). You would have returned on average 8.45% p.a. 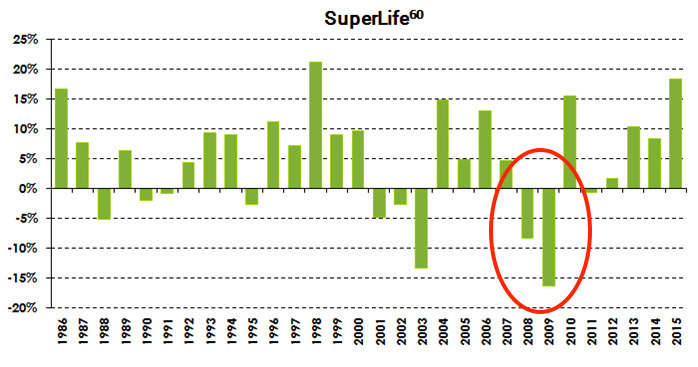 while SuperLife 60 was returning -0.55% in those four years. By looking at the math, it’s all great, but the main question is HOW DO YOU KNOW WHEN TO SWITCH? We are trying to time the market. The return looks great when we do it retrospectively, but in reality, it takes lots of time, resource and knowledge to time the market and people who are experts in that area still don’t get it right. If we switch too early, we may miss out on the last bit of gain. On the other hand, if we change too late, we will take the hit of the initial crash. I am personally not sure about this. I was trying to time the market back in 2014, and I was wrong. The conventional wisdom was to ignore the ups and downs of the market and keep your investment in a growth fund. You will ride it out eventually. However, somewhere in my mind I still think I can get a better return by switching. Not to a defensive scheme but a balanced scheme to smooth it out. I ended up keeping the growth fund and it turned out great. The return on those months is far better than the defensive fund. The main reason was due to the poor performance of income asset in the last quarter of 2016. However, this post is not about growth fund doing better than the defensive fund during that time period. In fact, I’d still be happy if the defensive fund did better because the performance for my KiwiSaver in a single quarter only has a tiny impact on the lifetime of my fund. The lesson I learned was to stick to right fund for me, just sit back and let it grow.